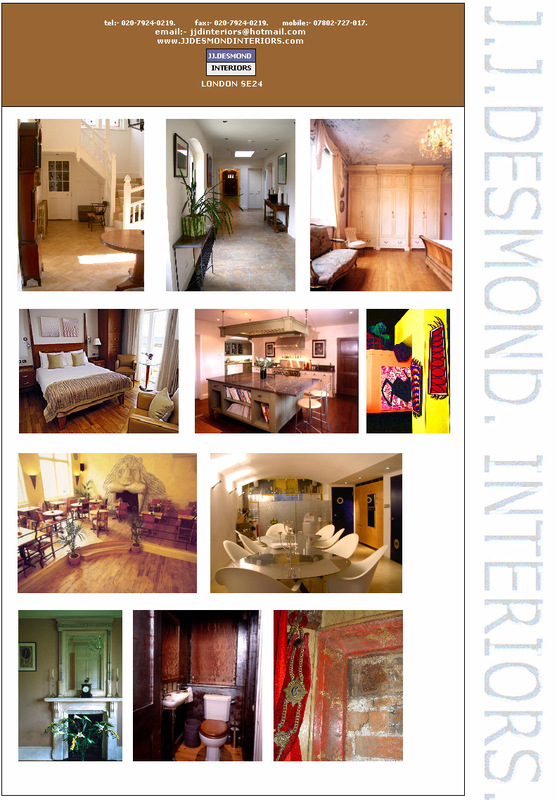 Welcome to J J Desmond Interiors incorporating Jerry Desmond, meant as a reference resource for existing clients, and therefore not the usual website format, it is of course open to anyone to view and use for contact. The pages describe a small selection of projects the team and I have run, producing physical hands on work, consulted on, or been involved in, over the years. Working from consultation, design through management/production to full building restoration. Due to the way we now work and the fact that we have met lots of contacts, particularly in France, Spain and UK, we have decided to set up this web site. Please have a look and if you have any questions please do not hesitate to contact Jerry, John or Simon on the website, or Jerry at the usual jjdinteriors@hotmail.com email. If you are on the look out for any furnishings, collectables, antiques, art works etc. Beds, sofas, chest of drawers, armoires, to tea caddies, dressing mirrors, vases......anything really, let us know. We spend a great deal of time trawling shops, galleries, exhibitions, sale rooms, auction houses etc. so we may be able to find what you?re looking for. We also have great contacts in France as well as all over the UK who are able to forward photos of potentially suitable pieces, usually for delivery within two weeks; and don?t forget you can still commission the team to design, decorate, build and make. If you would like to forward this web site address to friends and colleagues you feel may be interested, please be our guest, in fact we?d love it if you did. On behalf of the team, thanks for your time and best wishes. Jerry.